Viewing topic "Just Picked up an XF8 - Sweetwater Patches needed!" I just picked up the awesome Motif XF8. It has the Sweetwater sound boards but there was no USB drive with the patches. Does anyone have the patches they can send me? I’m sure it’s worth a little something! I just picked up the awesome Motif XF8. Congrats on getting a Motif XF8. It has the Sweetwater sound boards but there was no USB drive with the patches. There are no “Sweetwater sound boards”, although any flash modules might have waveforms originating from Sweetwater stored on them. Yamaha 512MB flash board (FL512M). DVD with several videos (including the XF Fully Loaded instructional), Chick Corea Mark V EP Sample Library, other libraries, etc. GEN16 Z-Pack Zildjian Cymbal VST with FXpansion Yamaha Maple Custom Drum Kit (2 CDs). Activation codes for VSTs - Steinberg Prologue and Yamaha YC-3B Organ Emulator. Keyfax New Media “Drums and Percussion” Patterns. 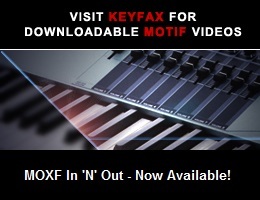 Discount coupons for KARMA Motif, XF Tools, etc. 4 GB Flash drive. Sweetwater did have a special 10th Anniversary deal where the FL512M was replaced with a FL1024M (1 GB), and the USB drive had a 570MB sound library named “Sweetwater_Motif10thALL.X3A”. The Sweetwater file loaded their material and the Chick Corea Mark V Voices by default to Voice banks USER 3 and 4. What is the name of the Voice in USER 3 A01 of your XF8? What is the name of the Voice in USER 4 A01? What are the “Total size” and “Free size” for FL1? Are there Waveforms listed for FL1? Does FL2 exist? If so, what sizes, and are there Waveforms? What’s in the box? Are there any of the items I listed above? The unit has the 10th anniversary box, has the Gen 16 Zildjan Cymbal pack, no video or flash drive. Which one do you think it is? Sounds like its the Sweetwater unit. Yes, likely the Sweetwater Pack. That’s approximately the size of the Sweetwater “All” file. Let us know the names of the first 10 and last 10 Waveforms in the Waveform List for FL1. I’ll check that against what the Sweetwater file loads. If they match, it might be possible to just load the Sweetwater file without samples. That’s a difference of 568MB for Waveforms, which fits with the 570MB size of the file. There are 133 Waveforms - the first 10 agree with what you posted. The last ones also agree by name, but not by number - instead of 522-532 (which is 11 of them, but who’s counting? :-) ), they’re 123-133. Apparently you’ve got some additional Waveforms on your flash module. I wonder if you have some duplicates. Which Waveforms are at 123-133 on yours? Any chance they’re the same as the last 11? Depending on your reply, I may be able to help. Whatever you do, don’t remove or add any samples to the flash module at this point, and don’t load any files. If you can, save an “All” file with samples to a USB flash drive. EDIT: See attachment for Waveform List. The Waveforms (not the samples) have apparently been loaded four times. I’m basing that on your Waveform List showing 532, which is 133 times 4. It will take some tedious work to resolve it, but it can be done. Rather than bore everyone else, I can help you if you send me a PM (Private Message) with your email address.